Home : Prairie Blog : All News : Happy Holidays from The Prairie School! 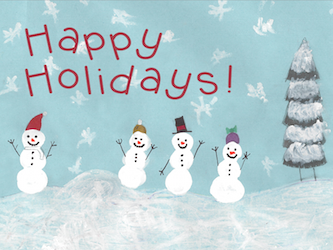 Happy Holidays from The Prairie School! It’s a wonderful time of year to get together with friends and family to celebrate and be thankful for all of the wonderful people in our lives. As we prepare for the holiday season, we feel compelled to express our gratitude for our many blessings. There is much to celebrate at Prairie this winter. The outstanding accomplishments of our faculty, staff, students in education, and the arts and athletics are what make Prairie one of the premier institutions across the nation. We also wish to extend a heartfelt appreciation to our alumni, volunteers, donors and community leaders who support and make possible our successes. Thank you for your ongoing support. On behalf of the entire Prairie School community, we wish you and your family a most happy and healthy holiday season! Each year, we ask our students to design our annual holiday card that is mailed to our friends and families of The Prairie School community. This year we had more than 200 submissions, and after careful review, artwork created by 5th Grader, Madeline Maraccini was chosen as this year’s design. Congratulations Madeline! To view a slideshow of all of this year’s submissions and holiday activities, click the video below. This entry was posted in All News, All School by Communications Department. Bookmark the permalink.